As a female modeling menswear four years now, I've been here and there in the Tampa Bay fashion scene. From walking the runway for shows like Tampa Bay Fashion Week, St. Pete Art & Fashion Week, Haute Accessories Fashion Week, Runaway to Runway Charity Fashion show and the glamorous Cocktails and Couture event, I've met all walks of life in the Tampa Bay art and fashion community. While working with different local fashion designers and photographers, I found myself as the only female-identified male model breaking into the bay area’s modeling industry. The acknowledgement from supporters in the fashion community around the world was fuel to the fire. My involvement in events like NYFW helped me connect with creative directors, fashion designers and stylists, make-up artists, and photographers-- all involved in the LGBTQ community. It means a lot that they support me and my goals as a female in the male modeling world. These individuals expressed great amounts of love and were intrigued in my endeavors. All that being said, something was missing. But I found that missing piece, thanks to my experience at the Trans Fashion Expo. On Saturday, November 18th, 2017, during Trans Awareness Week, the James A. Haley Veterans’ Hospital teamed up with the Metro Wellness & Community Center to produce the first ever Trans Fashion Expo, at the Metro Wellness & Community Center at the Ybor City location. I was super excited that my friend, Bonnie Bush, from the Crisis Center of Tampa Bay reached out to me to get involved as a masculine presenting fashion consultant. This event was created to provide a safe space without judgment for people to explore the ways they can comfortably express themselves in a world that perpetually discriminates against them. Tristan Richards Styles provided image consulting for the female-identified attendees. 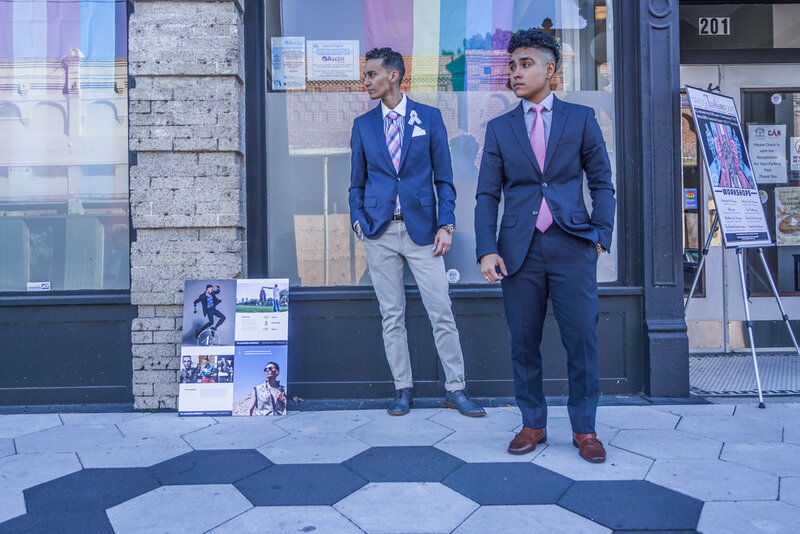 The Alvarado Experience blog and my recent announcement as a Brand Ambassador for Sharpe Suiting fit perfectly to provide masculine image consulting exposure to the trans men community at this event. My experience at the event— amazement. The trans men (commonly referred as female-to-male or FTM or F2M) and their willingness to open up and communicate about how they wish to define and express themselves through fashion, it was all moving. They were so ready for some direction. Some had no idea what words to use when I asked them, “What is your style?” or “What do you look for in clothes?” Most of the blank stares were as if they literally stepped on another planet and I was speaking a different language. Some displayed fear in their face because of their own thoughts. Shouldn’t I know what I want? The answer was “NO,” because the idea of really thinking about what they like and how they want to express themselves through clothes was previously too scary to consider. But as I asked their name, their occupation, and what clothes they were motivated by, their own personal style came shining through. Most of the day was spent educating trans men on what to look for in terms of finding clothing that compliments their body type. I also spent time teaching people how to read the brand labels' sizing used on dress shirt neck sizes, arm lengths, suiting chest jacket sizing and helped them understand the short, regular, and long designations that come with suiting blazers. There was a constant stream of Trans Fashion Expo attendees for almost a solid four hours with some people staying for most of that time to try on different sizing. Those same people came back to me for assistance, before moving on to another step. THIS IS WHAT I WAS MISSING. I met people who didn’t think they could shop at those fancy local boutiques. And others I met admitted it was their first local fashion show. I found myself immersed with this notion of a HUGE gap in the fashion/styling industry in the Tampa Bay area for the LGBTQ identified community. This ironic idea that fashion and clothing is for ALL is starting to become a reality in the commercial and retail markets. People want to spend their money on their personal style, but they don’t always have the guidance to flatter their body. They want to be confident and true to who they are as an individual. Every person should be able to express themselves to the fullest and I realized yesterday that there hasn’t been a support system for these individuals to allow them to create and accomplish their dreams in a dapper style. The Alvarado Experience is looking to change that. 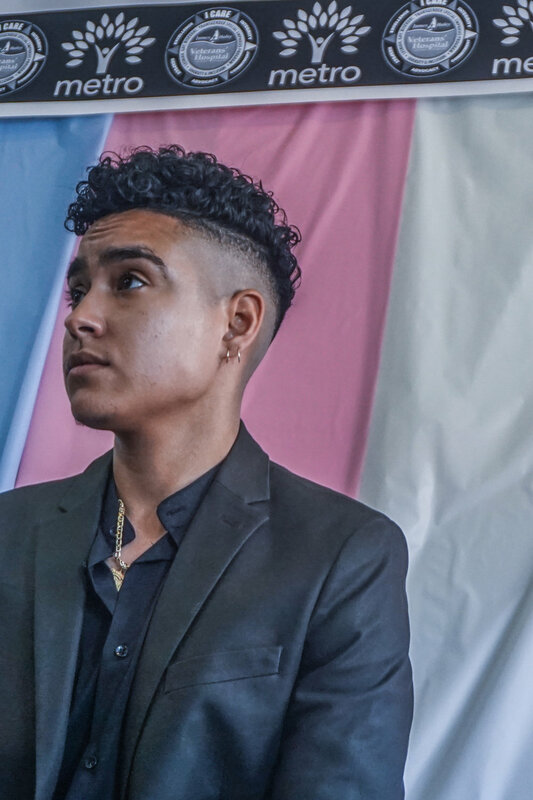 The Trans Fashion Expo event provided a FREE clothing drive for male, female and non-binary identified people to comfortably shop and select outfits that represent themselves as individuals. The Trans Fashion Expo is giving people the opportunity to showcase their very own personal style. The first 25 male and first 25 female identified attendees received special swag bags filled with goodies from various organizations and coupon discounts to meet their clothing or personal care needs. “Metro Bucks” were provided to every attendee to create a mock system for people to select up to (3) three full outfits and (2) two accessories of their choice. However, no volunteer or image consultant was counting pieces at the end of the day. Fitting room space was provided with various workshops and even FREE haircuts were provided for the entire duration of the event, thanks to Star Shear and her amazing commitment to assist the trans community with hair styles for all genders. Raffle items were the HOT items every hour of the 6-hour event. People would leave their workshops and rush back UP the stairs to see if they were a lucky winner. I was given the opportunity to represent the Men’s Wearhouse two-piece suit and led complimentary shirt and tie giveaways every hour. Yes, that was a total of (5) five suits that we gave away; thanks to gracious staff at Men’s Wearhouse and some members of our FTM community. I think my excitement for some of the winners surpassed their own; due to the simple fact that I already know what they are going to feel like in the perfect suit for them. The Alvarado Experience offered each winner the opportunity to have me as a personal shopping consultant, the day they decide to venture in the daunting and potentially overwhelming options at Men’s Wearhouse. The event was (overwhelmingly) a huge success and exceeded everyone's expectations. We are excited for the future of the Trans Fashion Expo! "Never been to anything like this event before!" Special Thanks to the Planning Committee for this Event! It wouldn't have been possible for all the volunteers and the support of each and every vendor who attended. Marcia Alvarado is the creative mind behind The Alvarado Experience. As an engineer, professional model, activist, and dreamer, there are no mountains she is afraid to climb. Her fascination with the architecture and modeling realms can be seen and reflected in her personal sense of style and fashion. Her innovative personality challenges her to explore the wide range of possibilities to grow awareness and exploration in androgynous fashion, lifestyle, and experiences. She continually challenges others and herself to break the normalities of society on all counts.